In order for a contract to be enforceable, it has to be free from any legally recognized defenses. A defense to any contract is essentially a defect that will prevent the contract from being enforced. This can result from different types of errors or the inability for one party to enter into the contract. Lack of capacity to form a contract typically comes in three forms: underage, mental incapacity, and intoxication. A person who is not of legal age typically cannot enter into any enforceable agreement. There may be some circumstances where that is waived, but in general, someone who has not yet reached the age of majority cannot enter into a legally binding contract on their own. 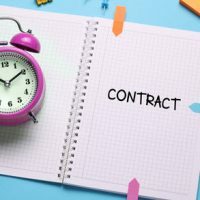 A person whose mental capacity is in question and cannot understand the terms of the contract may have a legal defense, as well as someone who was intoxicated at the time of entering into the contract. Even though someone possesses the legal capacity, they may lack consent. Undue influence or coercion on the side of one party can raise the legal argument of lack of consent. Other categories include misrepresentation and fraud. Misrepresentation involves a negligent misstatement which was the basis for entering into the contract, whereas fraud is when the person knows what they are saying is untrue. A mistake, which can be mutual or unilateral, may also be a legal defense to a contract. This means that due to some confusion by either one or both parties about a material fact in the contract, there is a chance it may be voidable. There is also the possibility of a mistake in transmission by an intermediary, or a confusion in value that can fall under the mistake defense. In some cases, the subject matter of the contract may be illegal. Contracts can be deemed illegal if they violate a statute, public policy, or a portion of the constitution. Problems with the legality of a contract are more common in some areas, including those that deal with gambling, restraint of trade, and crimes. In order to comply with the written requirements, there must be a note or memo that outlines the terms of the agreement, who the parties are, what the contract is about, consideration, and signature of the party who is being charged. Non-compliance of the statute of frauds means the contract could be rendered unenforceable. If you’re facing a contract dispute, or other business law matter, let an experienced Florida business law attorney help you navigate this challenging process. Contact McCabe Rabin, P.A. at 561-659-7878 or 877-915-4040 to set up a consultation today.